A collaborative project LIPA (Lightweight Integrated Process Application) betweeen a number of companies is now resulting in the series production of lightweight fibre composite parts.The project combines fabric-reinforced thermoplastic thermoforming with long-fibre direct injection moulding. Tepex fabric-reinforced thermoplasticsheets are cut to size and then pre-heated and then placed in the mould, where they are thermoformed and at the same time provided with moulded-on ribs, bearing eyes and other working parts. 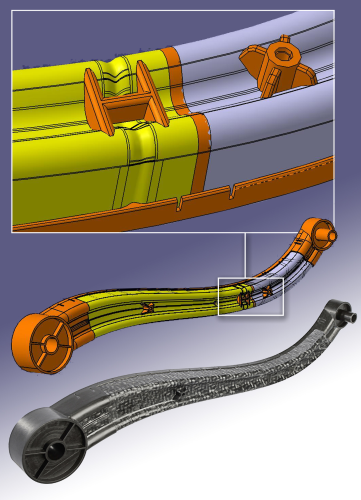 This is through the long-fibre direct injection moulding process developed German company Arburg. The result is a lightweight part of extremely high strength and stiffness. For the production of a demonstration lever, two pre-cut fabric-reinforced thermoplastic sheets of different thicknesses are gently heated up to thermoforming temperature in synchronism with the moulding cycle of the machine. A robot equipped with a vacuum gripper transfers the blanks into the mould cavity where they are thermoformed into a W-shaped profile. This not only increases the rigidity of the lever but also ensures a full-surface, firmly pressed, positive connection between the two component sheets. Stiffening ribs and an edging of long fibre-reinforced plastic are then injection moulded onto the sheets. As the temperature of the sheets is only slightly below the melting temperature of the base polymer, a good bond is ensured. For the same reason, it is also possible to produce moulded-on elements (for example, screw bosses) by injecting through the sheet without causing any damage to the fibre structure in the moulded part. In order that it can be connected to a mating part in a downstream process, the demonstration lever is provided with a corresponding hole during the moulding operation without adversely affecting the fibre structure. The LIPA project initiator is Georg Kaufmann Formenbau AG, with LIPA partners being Kistler Instrumente AG and Krelus Infrared. Other project partners include Arburg, Bond Laminates, FPT Robotik GmbH & Co. KG, Georg Kaufmann Concept GmbH, HRS, Lanxess Deutschland GmbH and SKZ – KFE gGmbH.